1.What is WP Travel Custom Filters? Installing WP Travel Custom Filters plugin is very simple. Please follow below-mentioned steps. Unzip the folder and Upload `WP Travel Custom Filter folder to the `/wp- content/plugins/` directory. After purchasing the WP Travel Custom Filter from the Theme palace, you will get the license key. You need to add this license key by going to Admin Panel > WP Travel > Settings > License. Inside the Custom Filter option, can create any number of filter as per your need. Custom Filter Label : This option allows you to add label to the custom filter. 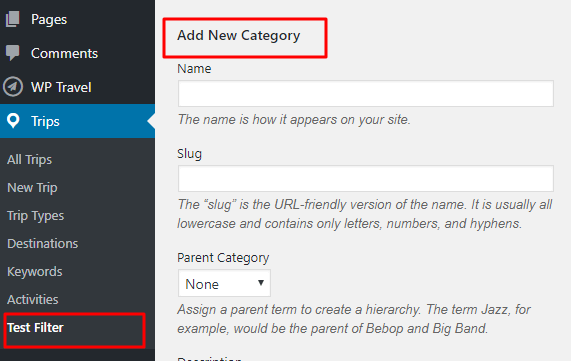 Custom Filter Slug : This option allows you to add slug to the custom filter. Custom Filter Hierarchical : This option allows you enable/disable option to make custom filter behave like “Post Category”. Disabling this option will make the filter similar to post tag. Show Admin Column : This option allows you to make the automatic creation of taxonomy columns on trips label. 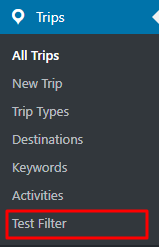 The Test Filter option will allow you to create the categories under which you can group the trips. After the category is assigned to the custom created filter, the category can be used to filter the trips in the front end. To make the search, add the WP Travel search widget where the row with the custom created filter will appear. Upon selecting the category that is assigned to the trip, the filtered result will appear in the front end. To update the WP Travel Custom Filters is an easy process. Please follow the below-given steps. If you already have WP Travel Custom Filter plugin then delete or replace it with the new zip file. Unzip the folder and Upload `WP Travel Custom Filter` folder to the `/wp- content/plugins/` directory.